What’s not to like about a meal that involves delicious ingredients and minimal washing up? Well, Anna Jones’ sweet courgettes with crispy chickpeas delivers on both counts. 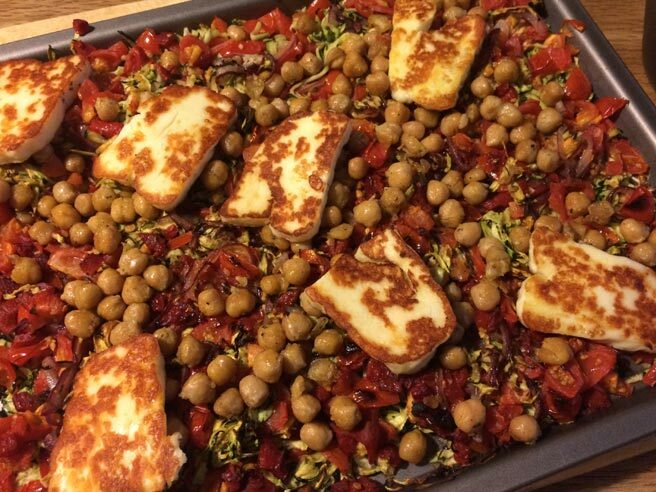 The perfectly matched charred courgettes, roasted peppers, crispy chickpeas and squeaky halloumi is my idea of heaven on a plate (or baking tray). And the addition of fragrant thyme and a punch of lemon zest, well, you’ll just have to try it and find out for yourself! It’s simple to make, with your tray gradually building in texture and flavours. The courgettes are grated and grilled, a ratatouille of roasted peppers, tomatoes, onions, garlic and thyme joins them, then the chickpeas are added and everything is toasted under the grill for a smoky, crunchy, delicious supper. Anna suggests adding grilled halloumi, if you want to make a more filling meal. The gas mark 5 house loves halloumi so it was a no brainer. I served the finished tray with a green salad tossed in lemon juice and olive oil and hunks of crusty ciabatta bread. The verdict from the husband: His usual ‘mmmmm, that’s nice’ whilst telling me what the ingredients are – presumably, just in case I’d forgotten. The verdict from the boy: ‘What’s that?’ Followed by ‘disgusting’ when I suggested he should try some.